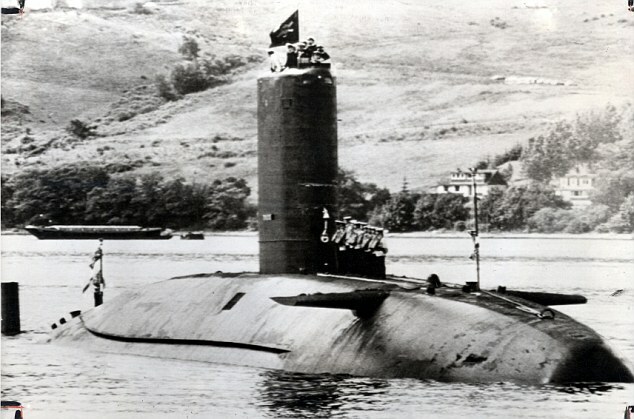 "Hit first, hit hard, and keep on hitting"
On the 21st of October 1960 the sleek black hull of HMS Dreadnought, Britain's first nuclear powered attack submarine, slipped into the water at Barrow in Furness. Like her immediate predecessor and namesake she brought a sweeping change in her wake. For the first time in the history of the British naval service the decisive arm of sea control, the "battlefleet", would operate beneath the waves rather than upon them. By the time that Dreadnought was commissioned, the Royal Navy had been operating submarines for sixty years. Despite this even the most modern diesel electric boats were, in 1963, primitive by comparison. The 2000 ton Porpoise class boats, built throughout the 1950s, could make a maximum of 17 knots while submerged. They also needed to frequently surface and run their diesel generators to recharge the batteries they used while submerged, and their limited fuel supply gives them relatively short legs. In comparison, the nuclear powered Dreadnought could cruise at 28 knots or more and remain submerged indefinitely; only constrained, in theory, by the supply of food needed for the crew. Even today the most modern non-nuclear submarines can only make ~20 knots while submerged. The nuclear powered attack submarine is the true capital ship of the 21st century, like the battleships that pre-dated them they are designed to sweep the seas clean of enemy warships, and confine hostile fleets to their bases for fear of destruction. This last point is especially important: the only time a nuclear submarine has ever acted against a surface ship in wartime it struck such a powerful blow to Argentine morale that the opposing fleet effectively confined itself to port for the rest of the conflict. Of course HMS Conqueror's famous attack on the Argentine cruiser Belgrano was hardly an even match, the Argentine navy had little experience with antisubmarine warfare and lacked the ability to effectively respond to Britain's fast nuclear powered submarines. What is far more telling though is the British experience of antisubmarine warfare in 1982. The Task force that sailed south was equipped with some of the most sophisticated ASW equipment available, designed to fight Soviet nuclear submarines in the Northeast Atlantic, and had no lack of experienced and well trained personnel. 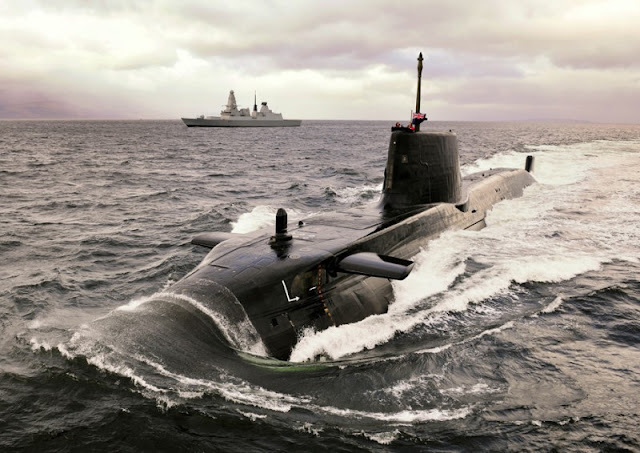 To put it bluntly the Royal Navy, even with modern equipment and training, failed to find and successfully engage the single semi-modern Argentine diesel electric submarine operating against the Task Force. It remains the case that the most effective weapon against a nuclear powered submarine is another submarine. Like the battleship before it the fast nuclear powered attack submarine is the supreme means of enforcing sea control, and denying the use of this space to the enemy. Jolly Rodger, signifying her successful attack on the Belgrano. At the height of it's power in the mid 1890s Britain maintained a "two power standard" which legally required the Royal Navy's battlefleet to be equal to the next two largest foreign fleets combined. The US Navy's submarine force currently stands more powerful, in numbers and tonnage of boats, than every other operator of nuclear attack submarines combined. It has a 3:1 advantage over it's only serious opponent, the Russian submarine force, which becomes close to 4:1 when it's European allies are factored in. It is this that ensures the US Navy is untouchable in almost any confrontation between fleets; and continues to reign supreme at sea, regardless of the deployment of ballistic missiles and advanced anti ship missiles designed to destroy aircraft carriers. While the aircraft carrier may still be the ultimate symbol of naval power and prestige, the nuclear attack submarine is currently it's most potent expression. With the capability to destroy surface ships with limited difficulty, and in doing so seriously degrade enemy morale, they can effectively dominate the strategic space. SSNs may not be as glamorous as the battleships that preceded them, in most cases the submarine arm tends to remain out of the limelight. In the UK and USA they are commonly known as "the silent service". We should never forget that their low profile is a function of the secret nature of their work, rather than their unimportance. In the 19th century Britain's "wooden walls", the battleships of Nelson's fleet, became ever more sophisticated walls of Iron and steam. Now those walls are invisible to most, lurking below the waves rather than riding atop them. Occasionally we glimpse the top of the sleek black pressure hull of a nuclear powered attack submarine, as a reminder that we are protected by the new hunters of the deep.